I spent a lot of time thinking about this month’s IMBB, hosted by Cathy over at my little kitchen. Typically when I eat beans, they are of them plain or refried with hot dogs variety. It wasn’t until I reached into my fridge, looking for a snack, and pulled out some hummus that it hit me: chickpeas. My first thought was to make hummus. I figured that with a theme like Beans, other people might be making hummus, too. I opted for falafel instead – besides, I already had pitas. I love falafel, but they’re not the healthiest things. The ingredients are super healthy, but they’re traditionally fried. This makes them nice and crispy, but I wanted something less greasy so I decided to oven “fry” mine. You might also notice that they’re a bit greenish, which is a result of using fresh parsley and cilantro in the recipe rather then dried. I won’t discriminate against falafels of different colors as long as they all taste good. Note: Be generous with the salt and pepper as you’re making them. The first batch I made was underseasoned. If you want them to be golden all over, I recommend flipping them halfway through baking or switching your oven to broil for the last minute. I tried spraying them all over with cooking spray and it had very little effect. My tasters actually prefered the ones that I hadn’t sprayed a second time. Update: I have since made these successfully using canned chickpeas, although I do think that the dried are the best way to go if you can remember to soak them ahead of time. Nicole – I actually had falafel for the very first time only recently. I really liked it and like the looks of yours. I love the fact that they’re baked and will definitely plan to give these a try! Thanks so much for participating in IMBB 11! And Zarah – I’m sure that they’ll come out. I hope you like them as much as I liked mine! Wow, they look so yummy, and I like the green color! I definitely want to try this. Do you think canned chickpeas will work too? I’ve never seen dried ones sold in Tokyo. Hi Lynn. I have heard that this will not work with canned chickpeas, but I would give it a shot anyway (a can of chickpeas won’t break the bank, and you could always use it to make hummus!). Drain them really well and eliminate the soaking. Let the chickpea mixture sit in the refrigerator for a bit before you form balls, so it will hold together a bit better. Let me know how they turn out! Thanks for the advice. I’ve bookmarked your page and will definitely let you know how it turns out. Nicole, I made your falafal to great success by using canned chickpeas. Taking your advice, I drained them overnight. I used one can and cut your recipe in half and it was perfect! My husband said it smelled nice when I was only blending everything in the food processor! Thanks a lot for a low fat AND great tasting recipe. I’m so glad that it worked out for you, Lynn. It’s great to know that the recipe works with canned chickpeas, as well as dried! Well, it wasn’t soon I tried the falafels, but now I have! They were great Nic, I’ll definitely be doing them again! I used canned chickpeas to, sans problems! Yummy! Zarah – I have also tried making this using canned chickpeas, since I heard that Lynn had good results with it. My only complaint was that they were ever so slightly more crumbly than the originals when I froze and defrosted them (I make big batches). But they still tasted great. I’m glad you enjoyed them. This was my first time making falafels. I followed the recipe exactly, except for changes in seasonings. I could only get my processor to blend so far though. I am not sure if it was smooth enough though? How smooth is it supposed to be? I would like to know what I did wrong and could it be that I need to upgrade my processor? Thank you very much! Your help is greatly appreciated. I really want to learn how. I still would appreciate feedback as to what went wrong for me with this recipe though, since the others seem to have had such good luck- although with canned beans instead, whereas yours was not. I just tried this recipe tonight– WOW! It’s wonderful! I’ve tried making fried falafel before and they always fell apart, so it’s good to see a recipe that’s intentionally for baking. Joy, mine never quite got a “smooth” consistency either, but when I added juuuust a bit of lemon juice and tahini it held together enough to bake. The fact that there were still visible pieces of chickpea helped add some delightful crunch to the finished batch. 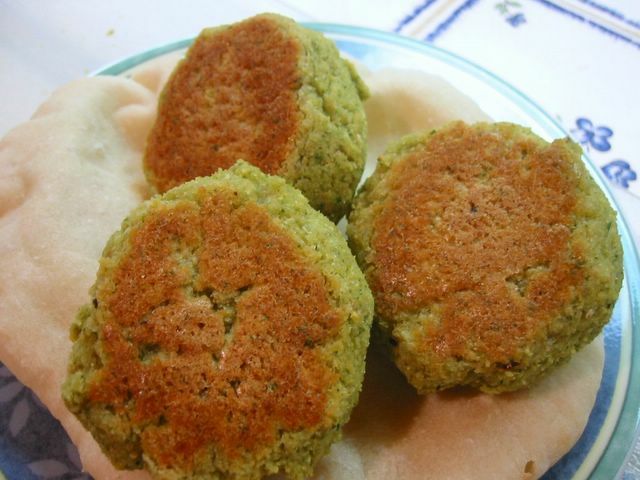 Now I’m stoked about all the falafels I’m putting in the freezer… the joy of these will last for ages!! I made these falafel for my friends the other night and they worked out really well. I actually used a dried soup mix that included barley, lentils, and kidney beans (no chickpeas). They required a little more cooking than posted but they were delicious. I am in the process of making them again :). Works great with Garbanzo flour too! Just be careful of how much liquid you use..
I’m so glad I found this recipe, and it has been reviewed. I was uncomfortable with frying falafel, but I love it so much. I hated going to the Purple Onion and paying 6 bucks for a sandwich that was fried and on white flour pita to boot. I will try to remember to post a review on this page when I make the falafel, which should be this weekend. Peace and blessings everyone! Can I use dry Navy beans instead of chickpeas for this recipe? Excellent articles on your blog, i share it with my friends from UK, keep growing it, Cheers ! Hi, I tried making your recipe last night and it turned out delicious…. The only problem I had was that it never really cooked through even after I left the balls in teh oven for about and hour at 450. I have always had this problem when making falafel, whether fried or baked. I usually use canned chick peas for my recipies. Any ideas on what would help? I tried this with canned chickpeas, and it worked really well! I baked them on parchment paper. I had previously tried frying eggless falafel, and they disintegrated. Baking worked perfectly! Thank you! For those who have tried using canned chickpeas, what volume should I used for this recipe? I looked up some information on bean conversion, and they say beans will triple in size when soaked, so in this case that would be 6 cups of chickpeas. Does that sound about right? This recipe is amazing! I just used 400g canned chickpeas and it came out perfect!